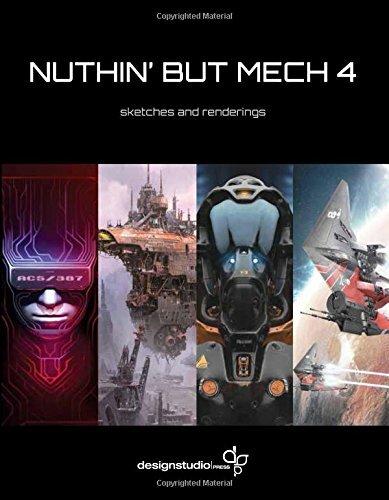 This is the fourth and last book in the Nuthin' but Mech series. I actually thought this series would go on forever since there are artists are always creating and putting out content. But it's a good time to end. Better have a series that people want more of, then a long drawn out series that make people wonder when it's going to end. Nuthin' but Mech has been a terrific showcase of art and talent around the world. Each volume features wonderful art and creativity, and this final volume is no different. The subject matter is still mechas and all things sci-fi. You'll get to see really detailed renders of 3D models, fully painted illustrations, scenes and design sketches. The artworks are high quality and refined. Some of those photo-real renders look so real. so good. This is the thickest volume yet with 188 pages, this time with 57 artists featured. The only improvement I can think of is perhaps have the artists talk about their art and creation process. I would love to find out how they draw, create, paint or render those amazing artworks. The only text included are short artist profiles. It's a great book. Highly recommend to concept artists and those who love sci-fi art. Do check out the earlier volumes too, and the Nuthin' but Mech blog.